In real estate contracts the contingency is a common element. Contingencies are clauses in a contract that give either the buyer or seller a way to get out of the contract if certain conditions or timelines aren’t met. A commonly used example is that of a buyer making an offer on a new home before selling his or her existing home. The buyer needs to sell his present home before being able to get financing on the new one. So he or she makes the offer contingent upon the sale of their existing home. There should always be a time period associated with such a contingency. If the buyer is able to get his present home sold within that time period, the deal can go forward. But if he fails to sell within the specified time period, the seller has the option of getting out of the deal. In most cases, sellers won’t accept this kind of contingency, because they will most likely feel that they can find another buyer capable of closing the deal without needing to sell another home first. Some new home builders are often willing to accept an offer contingent upon the sale of an existing home depending on how "hot" the market is at that time. Financing. Contingencies that depend on the buyer being able to obtain financing are very common however they are covered mostly by the Due Diligence Phase of the contract. Home Inspections. Probably the most common type of contingency is the Due Diligence Period. There are any number of specific types of inspections for which a buyer may want to have performed during the due diligence period specified in a contract. Some of the more common would include home inspections by a qualified home inspector for hidden defects, pest inspections, water and sewage system inspections, surveys, inspections dealing with the presence of radon or mold, etc. A buyer can decide to terminate the contract for any or no reason during the Due Diligence Period and receive their Earnest Money back but not their Due Diligence Fee if one was given at the execution of the contract. Appraisal. It’s not unusual for a buyer and their lender to require a formal appraised value at or above purchase price. Since lenders will nearly always want an appraisal performed, sellers usually don’t have a problem with this. It is important to include enough time in your Due Diligence Period mentioned above to receive the appraisal back. Remember, just like everything else in real estate contracts, contingencies are negotiable. 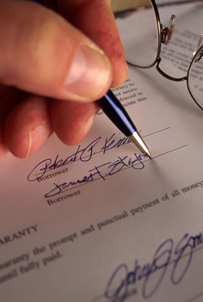 Always take care before signing that you are comfortable with all the specifics included in your contract. Likewise, take time to think about what inspections and details you might like to have addressed in the Offer to Purchase and Contract.